From left: Karina Puente, Mariam Williams, Rasheedah Phillips, Yolanda Wisher. Photo courtesy Rasheedah Phillips. 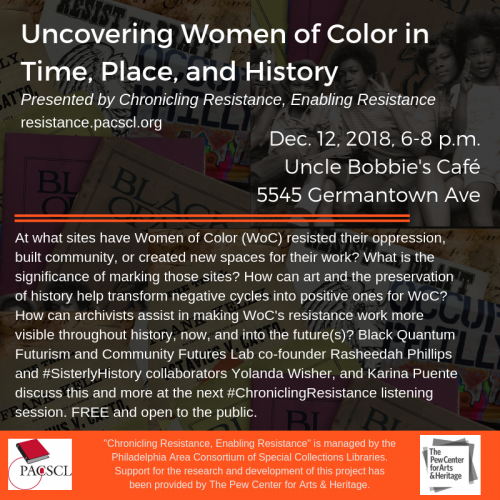 The session “Uncovering Women of Color in Time, Place, and History” was held December 12, 2018, at the Education Center of Uncle Bobbie’s Books and Café. 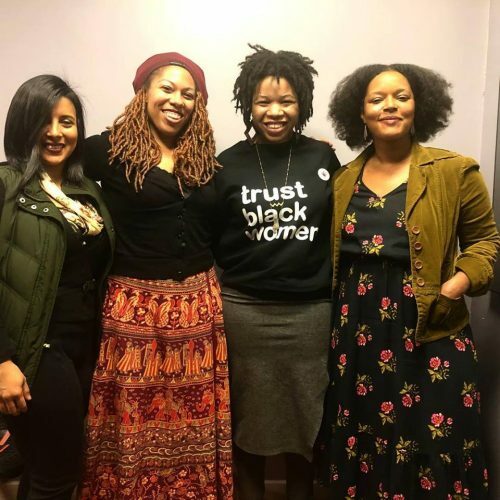 44 people attended a discussion with Rasheedah Phillips (Managing Attorney of the Landlord-Tenant Housing Unit at Community Legal Services of Philadelphia, Black Quantum Futurism Collective), Yolanda Wisher (poet, singer, educator, curator), and Karina Puente (artist). In a wide-ranging discussion, Phillips, Wisher, and Puente reflected on questions including the definition of resistance, how resistance is part of the work they do, the kinds of historical stories they include, and what it means to center women of color in their work. All the panelists emphasized the inspiration which they find in history and historical narratives. Wisher and Phillips both emphasized how hidden some of these stories are — for instance, Ona Judge, about whom there is only one book, and Rev. Leon Sullivan, whose story is not known in much of Philadelphia. Puente spoke about the importance of anchoring her work in a Latin American folk art tradition of papel picado (cut paper), and the history of that work. Phillips and Wisher discussed differing experiences of historical research. Phillips is a Temple graduate and while she had heard of the Blockson Collection while she was a student, she didn’t know it what it was or how to access it. (The Charles L. Blockson Afro-American Collection is an archive with more than 500,000 items pertaining to the global black experience.) Phillips’ perception at Temple was that the Blockson Collection was a resource that wasn’t really available to her. Wisher described her first visit to the Schomburg Center as a pilgrimage, and the importance for her of doing at least some research in a physical space. Much of the work of all the panelists combines the past, present, and future. Puente views her work in a traditional folk art medium as a way of conjuring the past and connecting to others who do or did similar work. Her current project, “#SisterlyHistory,” which is co-producing with Wisher, is designed to help women of color engaged in arts, cultural organizing, or entrepreneurship remember why they are doing it. Wisher talked about using her family stories in her work, and how the future in her work is in many ways about the past, as well. Phillips exhorted attendees to stop thinking of time as linear and progressive but to explore quantum physics, which sees time as moving in many directions, an idea which resonates with precolonial African practices. She also challenged attendees to question what values spur the desire to document (in writing), preserve, and institutionalize history. Are these values Eurocentric and capitalist? History among many precolonial indigenous populations was oral and was passed down; could archives be passed down the same way? Phillips discussed her work in Sharswood, a community in North Philly, which is undergoing rapid gentrification, and where the city demolished low-income housing using eminent domain. She had represented people as part of her work as attorney, but also felt compelled to do more. To bring an Afrofuturist lens to the work, she opened up a pop-up store front, and did oral-futurist interviews, sign making, and art. This was designed to push back against the narrative coming from the city and others about the neighborhood, and allow those living there to tell their story of their community. All emphasized the centrality of women of color in their work, and that they do not see this as a choice. Following the discussion, audience members filled out response cards. Then there was a question and comment session with attendees. Elements of the discussion included how to stay community focused, that the process of looking for a story is also a story, the importance of community control over both collections and where they are, and the contrast between the often metaphysical process of the creation of art and the order and process of archives. 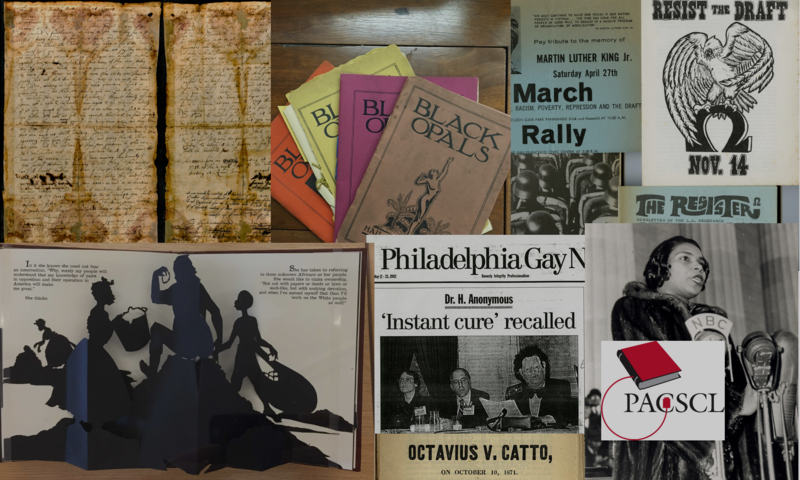 Wisher suggested art within the archives could be a bridge between the different processes, as art and artifacts connect with ancestry and add an element of the living within the institutional space.